Here's something you don't hear everyday: Senate Republicans appear to be caving, in a nearly unconditional surrender to Senate Democrats. They have reportedly agreed to confirm most of the nominees currently subject to Republican filibusters, in exchange for democrats not employing the nuclear option. If it's true, two of the nominees to a key labor agency will soon be replaced. Their identity remains unknown, but two Democratic Senate sources said that the new nominees to the National Labor Relations Board can be "any two we want." 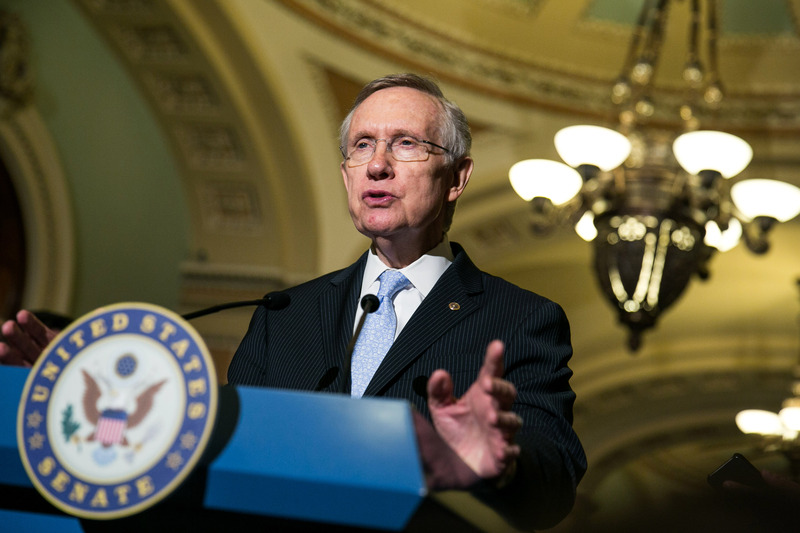 The news comes after Senate Majority Leader Harry Reid threatened to use the nuclear option, which would have prevented Republicans from being able to require a supermajority of 60 votes for the confirmation of presidential appointees. Reid argued that Senate Republicans are abusing Senate rules in order to keep the nominations in question from posts in federal agencies. Reid maintains the ability to decide whether or not filibusters can still exist for executive branch nominees like this one. During last night's negotiations, he even rejected Minority Leader Mitch McConnell's (R-KY) proposal to confirm the pending nominees in exchange for taking away the nuclear option. So for now, it remains on the table. Goes to show what happens when you fight fire with fire, doesn't it? That being said, Republican obstructionism has been going on for years, and we can't help but wish that Senate Democrats stood up against the filibuster a bit sooner. Senate Republicans are not only holding up too many executive branch employee nominations, but also federal court nominations. The number of unfilled judicial seats neared a historic high during President Obama's first term, which is hugely inefficient (and needless) deficiency of human resources. Had Senate Democrats acted sooner to change the filibuster rule, their endeavor might have saved the Democratic majority in the House. As this Huffington Post piece points out, voters were frustrated with Congressional inability to enact change. The consequence was that, come midterm election time in 2010, they voted several Democrats out of the House, giving Republicans the majority. However, the actual problem lay in Republican abuse of the filibuster in the Senate, which stopped many important bills from becoming law. Without a Republican filibuster, a public option would have been included in Obamacare. For many Democrats, the public option—which would have resulted in lower costs and greater savings to the budget—was the absolute top priority during the healthcare reform debate. Sounds a bit more compelling than employee nominations, doesn't it? Without a filibuster, unemployment benefits would have been extended, and more than two million unemployed citizens would have had to live in fear of them running out and losing the ability to pay for basics like rent, food, and gas. 5. Um, hello gun control. Without the filibuster, the very basic, very necessary bill requiring background checks on gun sales (you know, the one that 86% of the country approves?) would have passed.